You don’t hear that from Ray Kelly’s NYPD very often. We emailed the department’s public information office to see if NYPD has a citywide policy to encourage bicycling for local trips during the gas shortage. We’ll let you know if we hear back. Streetsblog’s press inquiry probably just got whoever wrote this notice fired from NYPD. We got news from folk who live & work in NYC on how, they arrived, on time at work on Tuesday 30th Oct, but had to abandon any prospect of working and went home, due to lack of power to get lifts to floors well up the building, and if there they would have had no power or comms feeds, and few co-workers. By 31st there was coffee and encouragement on the manhattan and Williamsburg ramps, and by 1st a valet bike park in Times Square with at least 3 timetabled bike trains departing for inbound and outbound commuting between Queens/Brooklyn/etc and Times Square. On spot count estimated 2500 bikes/hour coming off a bridge ramp, and day count figures for east river Bridges leapt up from 13,000 bikes to 30,000/day, crossing at afar higher rate that cars. From 30th bikes were being used as front-line logistics, and a giant bike trailer shipped in ‘000’s of cycle water bottles to fill and distribute drinking water supplies – by bike of course. On 2nd and 3rd mass volunteering by those with bikes saw a major logistics effort to get supplies into areas impassible to large motorised transport, including a battallion of loaded up bikes with their riders going aboard the Staten Island Ferry. And from what I’m seeing from a distance all this was driven and co-ordinated by NGO’s like Transportation Alternatives rather than agents of the Central city Administration. Considering the source, this is both surprising and refreshing. At least one person in the NYPD has some common sense. 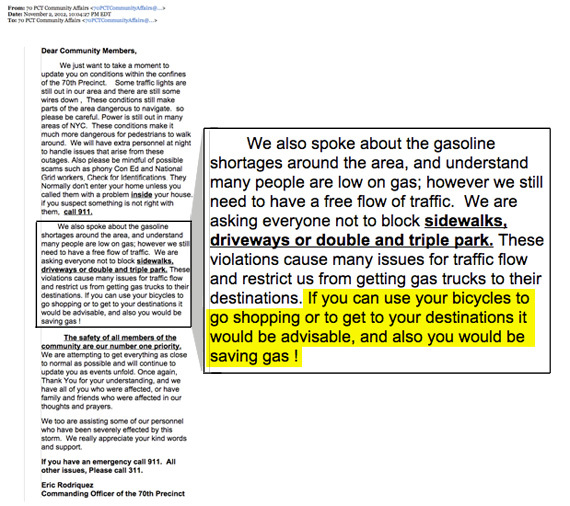 I live in the 70th Precinct & get these email updates from them…I wrote back to one of their post-Sandy-gas-shortage updates, and suggested they include bicycles…and they did!! Video Shows Driver Hitting Pedestrian in Brooklyn Crosswalk. Does NYPD Care?